Xolo would soon launch a new smartphone with Snapdragon S4 plus MSM8960 processor, the LT900. The smartphone will have stunning specifications and features compare to recent handsets. The Xolo LT900 appears in GFXbench results and Nenamark 2 scores. The handset would compete with Micromax’s upcoming handsets , the CANVAS TURBO A250 and A117 Magnus. The phone runs on Android 4.2.2 Jelly and supports 1196×720 pixels resolution HD display. The Xolo LT900 will have 1.5GHz Qualcomm Snapdragon S4 plus MSM8960 processor integrated with Adreno 225 GPU. The cpu is clocked at Min Freq of 384MHz and has peak frequency of 1512 MHz. The handset scores 52.60fps in Nenamark 2 and 250 frames in GFXbench which is higher than the company’s recent handsets. We hope that company would launch it before this Diwali. 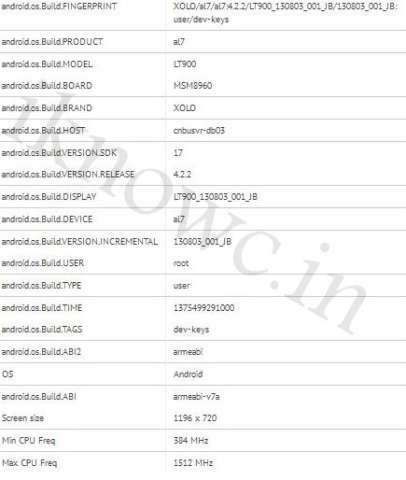 Although Xolo has not officially unveiled any details on the handset launch date, price and specifications. So stay tune for more on Iknowc, we will update if something new comes out related to the LT900.